I know, I know! That post title is a little too cheesy for words, but I couldn’t help it. Wait, what about this one, did you hear about the guy whose whole left side was cut off? He’s all right now. There! Now we have officially crossed the line. Ok, so let’s talk about the clothes. When I saw that baroque was a trend for fall I immediately fell in love with the regal and ornate details. I needed to add it to my closet that second. 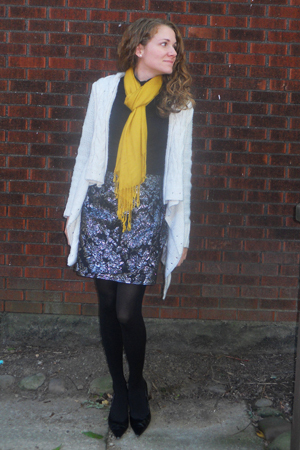 So I headed to the consignment shop I frequent, and picked up this Forever 21 skirt for $5. Here I have used a true fall palette of colors, but I think I might try pairing it with some brighter colors for something different. I love that whatever I pair it with, it will have that rich fall essence to it.